← Boy, do we love those Extra Magic Hours! Splash Mountain is a log flume ride, and yet it’s so much more than just a log flume ride. It’s a wonderful combination of drifting lazily along a mellow river, being entertained by the antics of Br’er Rabbit, and experiencing the thrill of several smaller drops that lead to the big one: a five-story plunge! After the finale, you’ll be humming “zip a dee doo dah” as you check out your ride picture (which is taken during the big drop). 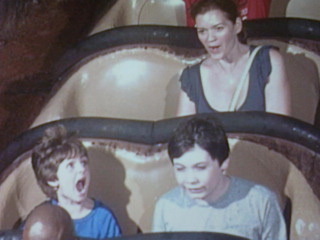 Recently, two of my boys wanted to do Splash Mountain as our last ride of the day. It was almost park closing time, so we hustled on over there. We just barely made it to the queue entrance as a cast member called out, “last call for Splash Mountain!” We rode the last log of the day, and what a thrill it was! I can truly say that there is absolutely nothing like watching the Wishes fireworks from the top of Splash Mountain. And, to our surprise, as we exited through the gift shop, we were presented with a free ride picture for being the last call riders! My little guy isn’t screaming from the drop; he’s wowed by the fireworks! This entry was posted in Disney, Magic Kingdom, Walt Disney World, Walt Disney World attractions and tagged Disney, log flume ride, Magic Kingdom, Splash Mountain, travel, vacation, Walt Disney World, Walt Disney World recommendations. Bookmark the permalink. 3 Responses to Disney Must-Do: Splash Mountain! I just love the music on this attraction! Thank you! It was quite an experience!! Your thoughts on Splash Mountain?